RFOptic is a leading manufacturer of RF over Fiber Transmitter/Transceiver Modules (RFOF) for commercial, military & defense markets. 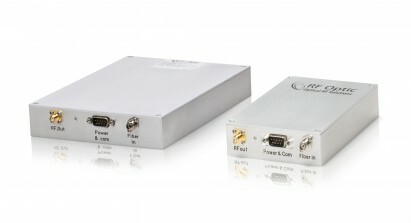 These RF over Fiber transmitters and receivers are relatively compact modules with various frequency ranges between 8GHz and up to and including 40 GHz. The electrical interface and dimensions can be tailored per customer request. Features include various RF gains, P1dB, noise figure by adding amplifiers, high P1dB`13 dBm and RS232 communications. Enclosures can be unidirectional or bidirectional. Options include: 8GHz RFoF (10MHz – 8.0GHz),15GHz RFoF (10MHz – 15GHz), 18GHz RFoF (10MHz – 18GHz), 20GHz RFoF (10MHz – 20GHz), 40GHz RFoF (10MHz – 40GHz). These broad spectrum solutions are RFoF links with Low Noise Amplifier (LNA) and attenuators which can be adjustable, or “programmable”, through the GUI. This enables the user to modify the System Gain, S21, P1dB compression point, and Noise Figure (NF) levels. The Noise Figure of these links can be as low as 5 dBm. Tx and Rx modules are quite small fitting into the palm of a hand. The units can be monitored and managed remotely with RFOptic’s unique SNMP/HTML capability. Options include: 2.5GHz RFoF with optional GPS (0.5MHz – 2.5GHz), 3.0GHz RFoF (0.5MHz – 3.0GHz), 4.0GHz RFoF (0.5MHz – 4.0GHz), 6.0GHz RFoF (0.5MHz – 6.0 GHz). Other options include: Bidirectional (2-way) over Fiber receiver (2.5GHz – 6.0GHz), RFoF multi-link series (0.5 MHz – 6.0 GHz), CWDM 8 channel multiplexer (mux) / demultiplexer (demux) devices, and Bidirectional RFoF Picosecond. 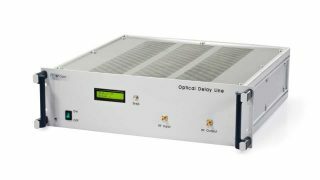 Options include: Fixed Optical Delay Line with 6GHz, 8GHz, 15GHz, 18GHz, 20GHz, and 40GHz (each of which supports up to 8 distinct delay lines). 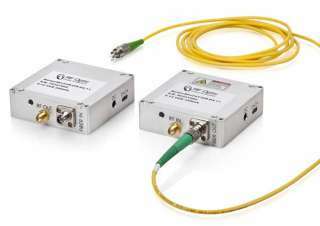 Other options include Variable ODL, also known as “switched ODL” or “progressive ODL” (when hundreds of delay combinations are needed), Mini Optical Delay Line (a compact desktop module that supports a single delay line of up to 15 microsec), and RFOptic’s ODL 2 Boxes series for testing and calibrating radar systems or for RF communication. Our small size analog RFoF cards are available for companies who need RF over Fiber technology in their products (high volumes of at least a few hundred units). This card, either Tx or Rx, comes as a board with optical, RF connector and DC interface. A control/diagnostic port is available in a small size micro USB interface on board. Options include: 0.05 MHz – 2.5GHz, 0.05 MHz – 3GHz, 0.05 MHz – 6GHz. Our user-friendly RFoF software enables monitoring and adjustment of the RF and Optical parameters, such as link gain, Noise Figure, P1dB, Optical power, status LED indication and module information, either locally or remotely. Thank you for filling out our contact form. We will contact you soon as we can.